You know what your going to say and what images will you use . Now put them in a slideshow to help that first page ranking! You have uploaded images onto the server. 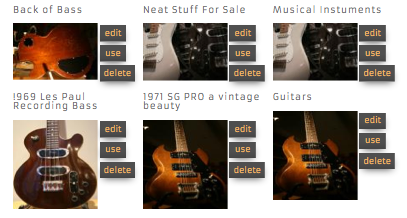 You've optimized the image tags for maximum possible search engine first page ranking. now let's place those images into a slideshow to get them working harder for you. First decide how much horizontal space the slideshow will take up. Because your web site page may be viewed on a number of different devices, most of the sizing done on your website is based on percentages. Whether a viewer is using a mobile or a huge desktop with a massive screen we create the web pages to fill a 100% of the screen. Inside the website we have different containers or DIV's which are again a percentage of that. Your slideshow will take up a percentage of the container you want it in. In almost every case we would put 100 for a fullwidth in the Slideshow Container width box. For height we enter in a number in pixels. The image above is 140 px. i like a slideshow height of 300-400, but that is up to you. The Image container sits inside the slideshow container. If you are not using a description in the slideshow set the image width also to 100. If you are using descriptions, they will appear beside the image. Decide how much in % the image should take and the remainder will be for description. For image height enter a number the same as or less than the slideshow container height. Images will be cropped from top left if they do not fit the container, they will not be resized as they can look pretty weird and not so nice in some cases. If you want all of all of the slides to be shown for sure, find out what is the biggest image height and set the height in both boxes so that all the image will show. Best practice is to create images of all being exactly the right size for the slideshow you want and upload them before you add slides into the slideshow. If are using captions or descriptions it is best to keep the fade speeds under 500 as the text overlaps and becomes confusing to read. Show Name, title, caption or desc? Simply click show or hide beside what you would like. when you click show, an alignment window appears and you can float the text accordingly within its container. Click list slideshows at the top of the page. 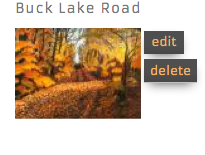 Click edit beside the slideshow name you would like you manage. To delete a slideshow press delete. The slideshow (not the images) will be removed from the server. Any pages you have that slideshow on will no longer show it. To clone a slideshow (use the same images and settings in a new one) press clone. remember to give the cloned slideshow a newname! To view a slideshow, press view. In edit mode on the right of the page are all the images available to you to use on the slideshow. Simply press use to add to a slideshow. pressing delete will remove it from the database and anywhere you may have used that image on the site will now have a broken link. Be sure you have not used an image before you delete it!